Pacific Dental Services of California helps talented dentists develop their business as part of a growing network of over 200 dental practices in CA, AZ, NV, CO, NM and TX. A number of Pacific Dental's nearly 4,000 team members and associates use FormDocs to record, exchange and integrate information that is vital to their stated goal of becoming the greatest dental company in America. FormDocs lets you easily design and fill-in your own customized healthcare and medical forms to record patient information, clinical data, or laboratory results. FormDocs is used extensively by healthcare providers worldwide (hospital, clinic, nursing home, assisted living center, private practice...), and by practitioners of all types (physician, dentist, psychologist, psychiatrist, mental health services counselor, therapist, visiting nurse, clinician, and social worker). Whether you need to design patient intake forms, treatment evaluation forms, or health assessment forms, FormDocs enables you to create forms that comply with all regulatory and statutory reporting standards - down to the smallest detail, including spell checking your medical terminology. For providers interested in HIPAA compliance, the FormDocs digital signature feature can be used to authenticate and secure patient information by requiring healthcare personnel to electronically sign forms they originate, modify or review. All completed forms can easily be organized into a Forms Database for quick retrieval so that you can locate in seconds any form by patient name, number, or other criteria. 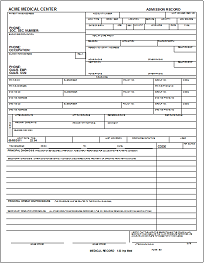 Use our ready-made sample forms, convert your paper forms or files, or design your own custom forms. If you already have patient or detail data in your own databases and spreadsheets, you can easily link that data to your forms for automatic fill-in using drop-down lists of names, Id's, codes, descriptions, and other routine information so that you'll spend less time typing. Enter an unlimited number of line items. Enter an unlimited amount of narrative text. Insert or attach copies of charts, x-rays, photos, notes and other documents to any form so that all related information remains bound together. Capture patient handwritten signatures using a Windows Tablet computer or popular signature pad devices. Export information from a form and import it into your back-end databases and spreadsheets. Recommended: FormDocs Scan & Fill.